These rings are specifically designed to be used on any high end sniper, target or hunting scopes with 34mm tubes.. Super Heavy Duty Steel construction for GREATER STABILITY! Height / Rise: Single Sniper Heavy Duty Ring is available in a 1.100" / (28mm) rise. This means that from the top of the rail / flat top / scope mount surface to the center of the 34mm diameter ring is 1.100" / (28mm). Every staff member at MFI shoots on a daily basis. We have these rings on many of our weapons that we test. Just a super quality ring at a very reasonable price. MFI has been working with Premier Reticles for the past year or so to develop a single ring that will meet a number of criteria. Basically the more we manufacture for different applications the more cost effective they become. Width of the ring should be such that the thickness is adequate to be used for both front and back positions on most scopes, thus eliminating the need for a wider ring in front. Height of the ring should be the bare minimum that can be used with the Premier Reticles 3-15 power Tactical scope with a 50mm objective lense on a flat rail WITHOUT the lenses cover attached and still clear the rail near the objective lenses. As you can see from our photos below where we use a PTR-91 and a 14" long MFI HK Low Profile Scope Mount, that the front of the objective lense just clears the rail. The outer most ring of the scope (used to provide a lip for the lens cap) fits down into the channel of the picatinny rail. Height of the ring should be allow minimum clearance for a M14 / M1A when using a ARMS M14 mount in conjunction with the PR 3-15 X 50mm Tactical scope WITH the lenses cover attached and still clear the hand guard near the objective lense. Height of the ring should be allow acceptable alignment to be used in conjunction with standard PVS-22, PVS-24 and PVS 27 Night Vision scopes. So on a FLAT RAIL the scope height for the 34mm should be within 40% of that of the standard height of the mount for the night vision scope. Ours allows nearly 68% meaning little or no loss in resolution from being off center. Height of the ring should be allow acceptable clearance, yet still being as low profile as possible to be used in conjunction with the SAKO TRG, Remington 700 or M24 Sniper Variants with standard scope mounts and using the either a Premier Reticles 3-15 X 50mm OBJ Tactical Scope or Premier Reticles 5-25 X 56mm OBJ Tactical Scope WITH the lenses cover attached and still clear the hand guard and or barrel. Rings should include an insert to reduce the ring diameter to 30mm in order to sell these into a double market. Rings should come with both Wrench Nut and Wing Nut / Tool-less style attachment points. Rings should be made in the USA. 100% 1913 Mil. Spec. Picatinny. All Steel Construction High Pressure Casting then Precision Machined from 4140. Designed to withstand the recoil of a 50 caliber BMG round. Designed to mount on Standard Dovetail (Weaver) or Picatinny 1913 Style Rails. Held securely by 4 socket head cap screws using a standard allen / hex key (NOT Torques or Phillips) for removal. 34mm Diameter but, also come with 30mm inserts (aluminum) for 30mm diameter optics. Overall Length / Thickness: @ 0.850 inch / 21.50 mm. Cross Over Lock Down Bolts are hardened Weapons Grade Steel. Super Knurled Wing Nut attachment for Fast & Easy ON and OFF. BOTH Wing Nuts and Standard Aim Point Style Locking Nuts are supplied at no added cost. Military Matt Black Finish (Black Oxide Coated Mil-C-13924 Standard). Top of ring has slots cut for lighter weight. Above is a Premier Reticles 3-15 X 50mm OBJ Tactical Scope with a 34mm tube. The rings are MFI 34mm Steel Heavy Duty Standard Height Sniper Rings mounted on a SAKO TRG-22. Note that there is plenty of clearance for even the larger Premier Reticles 5-25 X 56mm OBJ Tactical Scope to be used and still allow the use of the lense cover. 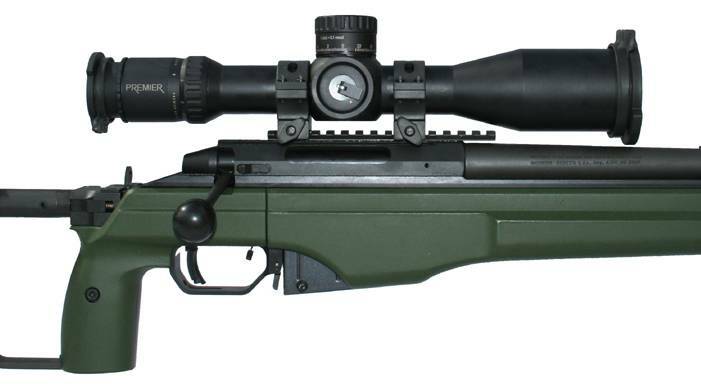 The SAKO TRG has about the same if not less clearance as most sniper rifles i.e. Remington 700 / M24 US Army & USMC sniper weapons platforms in the same area. Above is a Premier Reticles 3-15 X 50mm OBJ Tactical Scope with a 34mm tube. The rings are MFI 34mm Steel Heavy Duty Standard Height Sniper Rings mounted our MFI HK Low Profile Scope Mount. The weapon is a PTR-91 / JLD / HK91 / G3 variant / clone that has been dressed up to look like a HK PSG-1 Sniper Rifle. The stock is a Magpul PRS Sniper Stock while the pistol grip and hand guard are genuine HK PSG-1 parts. The fake silencer is an MFI SOCOM Universal mock / non-functional suppressor. You can see that the height of the ring is as MINIMUM as possible and still be able to mount to a flat railed weapons system. This is also to demonstrate the relationship of the height of the rings to a standard mounting height for the PVS-22, PVS 24 and or PVS-27 night vision optics. While not perfect it does allow nearly 70% compatibility which is well within the Military Spec. for alignment. Above is a Premier Reticles 3-15 X 50mm OBJ Tactical Scope with a 34mm tube. The rings are MFI 34mm Steel Heavy Duty Standard Height Sniper Rings mounted on a Springfield Armory Super Custom M1A / M14 that I built in 1981 for National Match Competition. The stock is a JAE - 100 Precision Sniper Stock which MFI exports for JAE. JAE is in our opinion the finest stock ever made for the M14 / M1A platform. Note that there is plenty of clearance for even the larger Premier Reticles 5-25 X 56mm OBJ Tactical Scope to be used and still allow the use of the lense cover. The fake silencer is an MFI SOCOM Universal mock / non-functional suppressor. 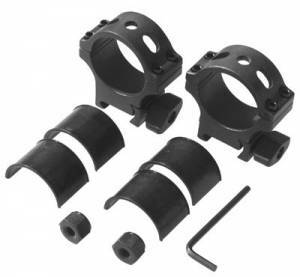 34mm Heavy Duty Steel Sniper Scope Rings comes with: (1) Pair of Rings, Wrench Style Locking Nut, Wing Nut / Finger Tightening Style Locking Nut, 30mm Reducing Adapter & Wrench. Best Deal For Steel Rings On The Planet! I bought these for my Rem 700 sniper rifle with a Leopold 3 X 9 scope... 30mm incerts work PERFECTLY. I also own $200.00+ 30mm rings from Barrett which are a little nicer finish, but no more stable that the MFI rings at 65% less... I plan to buy a couple more as the Wing Nut design is very nice and fast on and off WITHOUT any loss in ZERO!!! Thanks for a great product at a SUPER Price! I was sceptical that a set of steel rings would be any good when they were so cheap in price... Well I have a Barrett M82A1 and a Preimer Reticle scope... These rings while cosmetically not as good as Barrett's $250.00 set work 100% and hold ZERO 100% on a .50 BMG... so I am sure they will work on all other calibers. Of course at 1/3rd the cost who cares about a dull spot or two on the finish. I am in the service, but I bought these for my personal weapon, as I am not a sniper. I questioned how good they could be when they cost 1/3 that of other 34mm rings. I have a Premier Reticle Sniper scope mounted on my SAKO 338 Lapua. The finish of the rings are very good (not perfect, but who cares at this price). I had been using PRI rings, but was having issues with retaining zero when I removed the scope. These MFI rings are super heavy duty and fit perfectly. I love the large wing nut... After paying $4600.00 for the rifle, $3800.00 for the scope the rings were a steal at $68.00 for the set?? How do they make these so cheap? I have bought 10 other steel rings in 30mm to try and these are the lowest and most cost effective... in fact 1/4 the price of other steel rings and are better quality too! I use these with a Barrett 98 Brovo in .338 Lapua witha US Optic scope... holds zero out to 800 meters... I have yet to find a place to shoot past that, but will let you know when I do. Sturdy, workmanlike, but not pretty. I used these rings(and 30mm inserts) to mount a "Super Sniper" 10X on my Rem.700 Sendero in 300 WM. They're not pretty, the finish is rough. But they are solid, and hold zero with the heavy recoil of my handloads. Great ring for the price. I like the knurled, no slip finish on the thumb screws, but I used the hex nuts for added security.